Vision Zero supporters disparaged the union for reigniting this whack-a-mole issue that has already significantly delayed key safe-streets projects in the Tenderloin, on Upper Market, and in SoMa. “Since the untimely death of Mayor Lee, it’s been troubling to see folks in and around City Hall trying to undermine our City’s commitments to Vision Zero,” wrote Chris Cassidy, spokesman for the San Francisco Bicycle Coalition. “We understand that response time is a major concern for the Fire Department. But allowing them to have veto power over street safety improvements will only result in more dangerous streets for the rest of us, which will lead to more crashes that SFFD has to respond to,” wrote Walk San Francisco’s Cathy DeLuca. It was only a few weeks ago that advocates, including DeLuca, the SFBC’s Brian Wiedenmeier, and high-ranking city officials celebrated the first evidence that the Vision Zero program is working, citing a significant (albeit possibly anomalous) drop in fatalities. In 2013, the year before Vision Zero was launched in San Francisco, there were 34 fatalities. In 2017, there were 20. At the meeting, Fire Chief Joanne Hayes-White seemed to try and bury the hatchet with safe-streets advocates, stressing that firefighters see the pain of car crashes up close and that they fully support Vision Zero. Pursuant to that, the department is acquiring ‘Vision Zero Trucks‘ that can better navigate bulb-outs, bike lanes and other features of Vision Zero street engineering. And the fire department is already carefully consulted about street changes at the city’s ‘Transportation Advisory Staff Committee’ (TASC) by SFMTA staff. The fire marshal already wields significant power over the designs. It’s important to restate that street collisions are responsible for over 50 percent of SFFD calls in some areas, while high-rise building fires are–thankfully–rare in modern times. Given the statistics, it would be insane to allow the department to veto Vision Zero projects rather than finding ways to allow ladder trucks to access buildings (such as getting more of the aforementioned ‘Vision Zero’ trucks or restricting on-street car parking). This was further highlighted yesterday: two pedestrians were seriously injured in San Francisco in two separate collisions, as reported by the Bay City News. One woman was run down by a truck at the intersection of Persia Avenue and Moscow Street in the Excelsior District. Another woman was hit in the Inner Sunset. Both intersections lack bulb-outs or any other concrete safety treatments that force motorists to slow down. Neither incident required a fire department ladder truck (or any kind of fire truck, for that matter). Fortunately, the Examiner reported that mayoral candidates London Breed, Jane Kim, and Mark Leno all gave the union nuanced answers, acknowledging firefighter concerns with the placement of bike lanes near Muni wires, for example. But none endorsed giving the fire marshal the veto power the union wants. 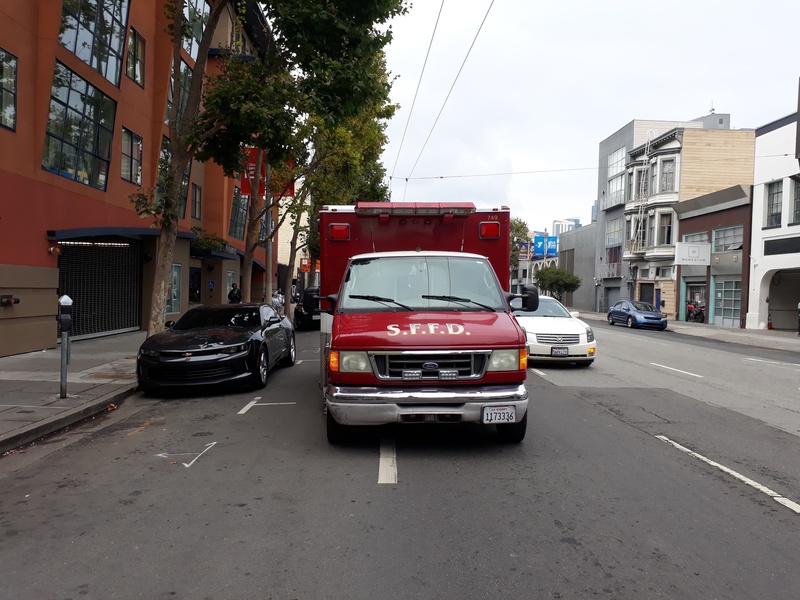 As to the lead image for this story, here’s a picture of that fire truck’s crew (just in case readers were wondering if they parked on the bike lane to respond to an emergency). The crew of the fire truck in the lead image was responding to JoJo’s Korean food truck which, while delicious, did not necessitate creating a hazardous condition for cyclists. They need to keep the streets dangerous so they can quickly get to all the resulting injured and dead people. Instead of granting veto power to any org, why not just let the facts speak? If street changes truly impede emergency response then adapt either the street design or the emergency vehicles that are used (or both). This straightforward, objective issue shouldn’t be based on opinion. This quip was already in the article! They reserve the right to park their personal vehicles in the bike lanes, too. The lane in front of the fire station at Folsom & 5th is at least partially blocked by SUVs & pickup trucks almost every day. Public safety involves burning buildings and people getting hit and injured or killed on our streets. I hope all of our emergency responders realize how many more people are affected by street safety issues than fires. FYI: there’s a geo tag in the original image, Howard and 6th. It would have been nice to see an article like this about FDNY in NYC in 2016. In earlier posts I suggested other approaches to Vision Zero since it is national and international. The City of Austin is dealing with this issue too. Their Fire Department has upped the ante with a 25-foot clear requirement. Even existing projects that are approved are being required to be redesigned. Let it be a reminder that transit lanes are also great emergency lanes and that bike lanes can actually be circumvented as clear zones for firefighting. it’s the immovable objects like parked cars and especially larger vehicles like trucks that get in the way. concrete curbs and islands can be made so trucks can get on or over them, but like many things, PEOPLE need to pay attention and move over to get out of the way when they hear a siren. We’ve lost a lot of common sense and please, stop chasing after fire trucks, they are not pace cars to get you through traffic either! Well that too, but I’m taking about plain old civilian vehicles. I assume, but don’t know, that it’s people working at the station parking their personal vehicles while they’re on duty. Find out if your partner/spouse is cheating on you or having a secret love affair outside, hack any mobile phone, email hack, social media hack or any other type of hack you could possibly think of done with the help of CERTIFIEDHACKER4REAL at Gmail dot Com, he is a professional and certified hacker, a genius at what he does, he helped me unravel and got all the facts I needed to prove my partner had been cheating on me all along for a long while even before and during our divorce cases. Contact him if you need any of the above listed services or any other related service. It was never going to be easy to shift Los Angeles decision-makers' attitudes to care more about keeping people alive than about moving cars. Nonetheless, L.A.'s mayor and city council have approved the city's Vision Zero policy, and directed city departments to work together to reduce L.A. traffic fatalities.